Named after the iconic Fig tree growing on the banks of the Thames where Chelsea Bridge meets The Embankment. Featured as the main hideout in William Boyd's novel Ordinary Thunderstorms. Great flavour and strong yield. Propagated by fruit grower Will Sibley. 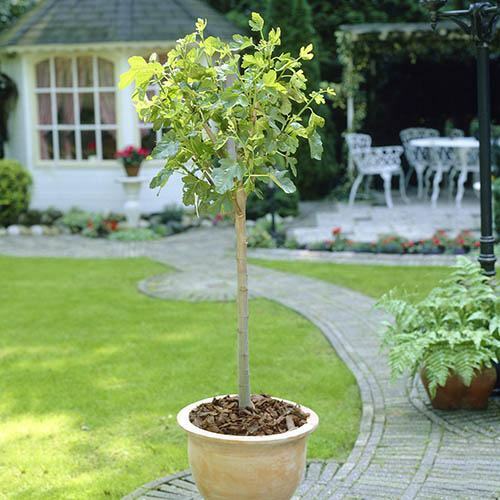 Supplied as a 1M tall standard fig tree, with many branches at crown. To fruit in first season. Many Londoners know of a fabulous and fruitful Fig Tree, growing on the banks of the Thames where Chelsea Bridge meets The Embankment. Each Summer it's huge crops are joyfully plundered - either by flocks of parakeets high up in the tree - or cheeky human scrumpers lower down where it can be reached. Either way, it produces huge crops of figs every year. So well-known is this specific tree, it even featured as the main hideout in William Boyd's novel Ordinary Thunderstorms. Fruit grower Will Sibley knew of this tree, and had tasted it's fruit. he took samples away to analyse, and concluded it was a chance seedling - a single and unique tree like no other variety grown. So good was the flavour and yeild, he set about propagating and grafting trees to sell from it - and here we are now selling them. Now called 'The Chelsea Fig', every single tree is identical the one by the river. Get yourself a piece of London history and folklore, and grow them in your garden. Supplied as a 1M tall standard for fig tree, with many branches at crown. To fruit in first season. Early spring: remove any branches that spoil the shape, or any that are crossing or damaged, along with any suckers appearing from the ground or lower stem. If needed cut back one or two branches that have become too long and bare to a 5cm (2in) stub to stimulate new growth from the base of the branch.